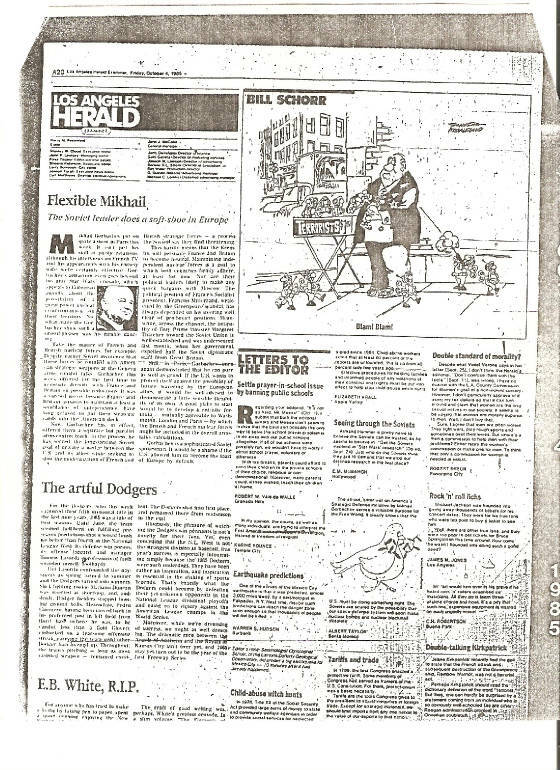 Does this Hearst Corporation editorial page cartoon in the 4 October 1985 edition of the now-defunct Los Angeles Herald-Examiner constitute evidence of a conspiracy to commit a political assassination a week later on 11 October 1985? 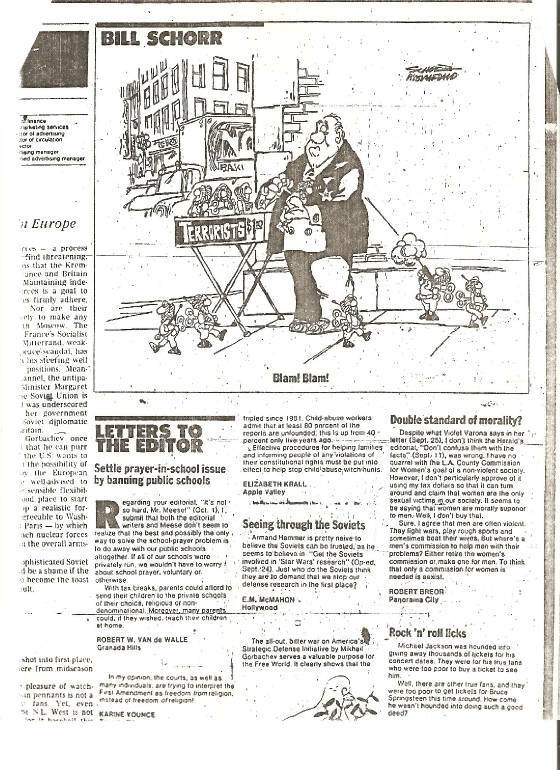 Below is a Bill Schorr cartoon that appeared on the editorial page of the now defunct Los Angeles Herald Examiner on 4 October 1985, exactly a week before Alex Odeh was killed in an explosion when he opened the door of his office in Santa Ana, California, on the morning of 11 October 1985. Normally Alex's administrative assistant Hind Baki would arrive first to open the office each morning, but on this day it was Alex who opened the door, which was rigged with a bomb. Look carefully at the cartoon. Can you find Hind Baki's name in it? To blend printed information among the pen strokes of a cartoon is a known military intelligence technique for conveying secret communications. In this case, one must ask, was the assassination of Alex Odeh a military intelligence operation carried out in tandem with the denouement of the Achille Lauro affair? Was the editorial page of this Hearst newspaper used to carry out the assassination with a signal planted inside this Bill Schorr cartoon? If you still haven't found BAKI in the cartoon, then go back to the blow-up above and focus on the side panel of the truck right under the large white letters NO. NO BAKI sounds a tad bit negative, wouldn't you say? Sounds like a threat to me! Who could have done such a thing? Who would have done such a thing? Who within the FBI could turn the investigation away from these weird, disturbing facts? Who within the FBI would turn the investigation away from these weird and disturbing facts? There is a praxis of evil in our government that frames Arabs and Muslims in sting and false flag operations when not murdering them directly! Is the lack of progress in the FBI's investigation of the Alex Odeh assassination indicative of the Talmudic law of the Moser at work? The Talmudic law of the Moser prohibits a Jew from informing on another Jew to a non-Jew. Think about it! Hind Baki is from Syria and Alex was a displaced Palestinian. Here's the invitation she sent me to visit with Alex at his home in Orange County. It is among the last, if not the very last item to be mailed from this office the day before the bomb exploded. Again, I repeat: Is the lack of progress in the investigation into the assassination of Alex Odeh due to the Talmudic law of the Moser, which prohibits a Jew from informing on another Jew to a non-Jew, directly or indirectly? To read copies of some of the correspondence that I have undertaken over the course of decades to urge a full, fair and unbiased investigation of the murder of Alex Odeh, please go to http://www.show-the-house.com/id33.html. Thank you!